April | 2012 | Better Offer? Last year, the church I attend became so full, people were unable to squeeze in! It was necessary to look elsewhere to hold the regular Sunday service. Fortunately, a local school had a hall big enough for us to move into once a week. On Sunday, I had to make use of one of the school’s conveniences! Whilst making my visit, my attention was drawn to a poster on the wall displaying instructions for washing hands. I realise I was in a school, and that is where people go to be taught, but the children who attend this particular establishment are of an age where hand washing should be second nature. However, I accept that there are many people, of all ages, in our society who neglect to wash their hands following a visit to the toilet, so perhaps this was a little reminder. That said, I felt this reminder was a touch overboard and would have been more appropriate over the wash basins of an operating theatre. And it was a sign issued by the National Health Service. That’s a good start – it always helps to use water! Apply enough soap to cover all hand surfaces? Is that the best way the NHS could have put this instruction? That almost feels like you need to be a contortionist to achieve this! Step 6 – Rub with back of fingers to opposing palms with fingers interlaced. I think that means “rub your fingers together as if your hands are cold”. Do you rotate the hand of the thumb being held, or the hand holding the thumb? As if you have itchy palms? Well, I doubt you could rub each wrist with the same hand! Ah yes, back to using some water. Step 11 – Use elbow to turn off tap. Now that’s OK with the sort of tap in the pictures, but the tap on the basin over which this poster appeared was the type you have to twist on and off. I tried to use my elbow, but I just couldn’t get the thing to turn! Step 12 – Dry thoroughly with a single use towel. If you have washed according to the instructions, the single use paper towels supplied wouldn’t even dry one hand, let alone the wrists as well. Step 13 – Hand washing should take 15 – 30 seconds. Darn it, I forgot to time myself. Having followed those instructions to the letter, or at least as closely as I could, I left the toilet with both arms bent at the elbow and hands up towards my face, expecting someone to slap a pair of rubber gloves on them. 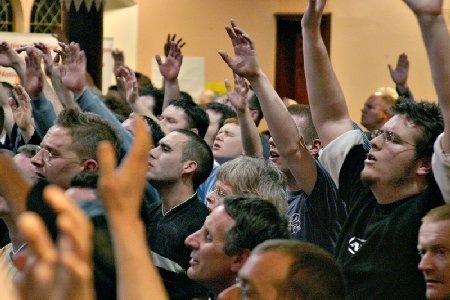 A lot of people in my church will raise their hands in a similar fashion when worshipping, but not usually as they come out of the wash rooms! People worshipping? Or have they just washed their hands? Categories: Communication, Education, Light Hearted, Pedantry, Postaweek2012, Religion, Schools | Tags: Hand Washing, Hands, Health, National Health Service, NHS, Postaweek2012, wash basins, washing hands | Permalink.